Between Zion National Park and St. George is a wonderful adventure through Yankee Doodle Canyon, a short but fun slot. Until recently the canyon was pretty much left unexplored, but with the advent of canyoneering, and the tools and techniques that aid in the enjoyment of this relatively new sport, Yankee Doodle has become a more popular spot to visit. 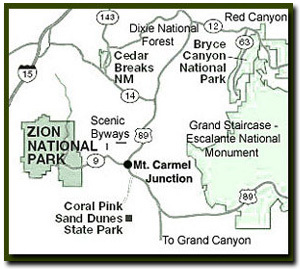 Located in Dixie National Forest, just west of Leeds, access is generally gentle and fast. 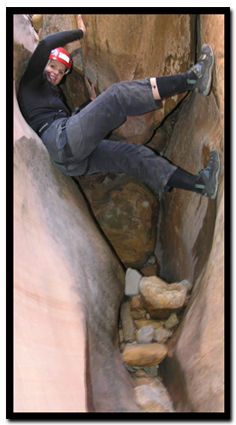 The canyon offers the chance to practice such skills as rappelling, down climbing, anchor techniques and partner assists while navigating a beautiful slot canyon. Be certain that you have some basic climbing and canyoneering skills before attempting this canyon. Even though this slot is in the forest we included it with Zion since that is where most people will look for slot canyons. Equipment: One 170' rope and another 50' rope should be on hand to descend the canyon plus a helmet, harness, rappel device, map, dry bag and possibly a wetsuit. Technical: One rappel but numerous down climbs. Difficulty: Good down climbing skills are needed for the many obstacles and there is one technical rappel. Trailhead: The exit to Leeds/Silver Reef is approximately 14 miles north of St. George, Utah on I-15, or if traveling south on I-15 approximately 3.5 miles south of the Zion/ Toquerville exit. Best Season: Good summer, spring and fall canyon, but the canyon may hold water so a wetsuit would be required. Winter and spring would probably be the most likely time water would be in he canyon. Hazards: Hiking in slot canyons presents a very real danger from flash flooding. Do not hike this trail if it is raining. Remember a storm far off can trigger a flash flood. Yankee Doodle Canyon is a slot canyon and like any slot canyon there is a very real danger from flash flooding. Do not hike this trail if it is raining. Remember a storm far off can trigger a flash flood. Flash flood danger is high. Take the road to Silver Reef from Leeds heading toward Pine Valley Mountain. Once in Silver Reef the paved road will turn to dirt as it crosses the bridge over Leeds Creek. Set the odometer at the bridge and continue up the dirt road for 1.7 miles to the intersection. Go left at the intersection and follow the dirt road as it ascends the steep hillside above the canyon. The road will turn and twist, and bypass a ranch and at 7.8 miles there will be a pull-out on the right. Park here, gather your gear and hike up the road for about 20 yards where you should find a cairn on the left side of the road. Follow the trail 100 yards until the canyon floor drops out abruptly. This is Yankee Doodle Canyon. Tanya Milligan on one of the many down-climbs in Yankee Doodle Canyon. This is a wonderful slot canyon located south of Zion National Park. There are rapells and downclimbs in once in a while there is ice cold water in the slot. Yankee Doodle Canyon - There is a large juniper tree on the left (when looking down canyon) side of the head of the canyon. This makes a good anchor to for the 170' rope. Rappel 25' to the grotto below and stay hooked into the rappel. The notch just 20 yards down canyon is a wonderful fluted drop of maybe 100'. Leave the rope suspended as it will be picked up after the hike is completed. Continue down canyon on foot and shortly the down climbing begins. Some of the climbs are piece of cake and some are intimidating. The 50' rope can be used to belay or assist those that may be unsure. The strongest climber of the party should always be last to descend. Using stemming to chimney seems to be a good technique and spotting from below is also a good idea. Most of the down climbs are short, but a few are up to 25'. Exit - Most of the canyon remains quite narrow with vertical sandstone walls that prevent escape. Before the canyon comes to and end, and less than a half mile downstream from the start is a steep slab up-climb which you will need to scramble up to exit the canyon . The exit follows a down climb into what could be a pool of water and a then another possible pool of water. The canyon then opens up to show a sandy canyon floor littered with fairly large boulders. Looking to the left (looking down canyon) there is a steep slab and a right facing corner to the left of the slab running vertically 40'to some vegetation. Use the featured arête and the roots to scale up the left side of this slab. Partway up to the vegetation is a small ledge bearing right. Follow the ledge 20' to the right and find the faint moki-steps. These will help you up the short 3' un-featured climb. Scramble up to the vegetation and prow another 20' to the right. There is a faint trail that leads toward a drainage. It will be necessary to overcome another 8' steep climb to the left to avoid the wash far below and to the right. Once on top of the slab, the trail then skirts above and eventually drops into the wash below. Follow the wash as it ascends through vegetation and boulders until it meets the road. Now turn left and follow the road for 300 Yards to arrive back to the vehicle.